'The biggest positive feedback I'm hearing is about the schedule status. People can look from their home and see if there is a crew or an (open slot) to fill. The custom form creation is a great addition. It allows us to go completely paperless for most purposes.' 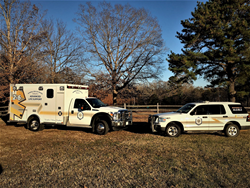 -- Chief Scot Newton Sr.
First-responders with Louisa County's Mineral Rescue Squad, Inc. recently began using a cloud-based software application that simplifies scheduling, streamlines communications, and saves members time with routine stationhouse tasks. Scot Newton Sr., chief of the 21-member Mineral Rescue Squad -- a volunteer Emergency Medical Services agency -- said he heard about Aladtec from a member of another department, and then tried out a free demo. Previously, Newton crafted monthly schedules on paper and posted the monthly roster and made changes on a whiteboard in the station. The old method didn't allow administrators to know who was available and where there were unfilled slots. "The program gives you (information) in real-time," Newton said. "The software allows us to streamline our scheduling, do truck checks and inspections, and a multitude of other things. It keeps everyone in-touch and provides streamlined accountability for the bookkeepers." Aladtec, labeled "software-as-a-service," in computer parlance, streamlines the process of assembling complicated schedules. It uses e-mail and texting tools that allow members to trade shifts, request time-off, be notified of open shifts and report overtime hours, via smartphone or another computer device from anywhere they have internet connectivity. The program also allows agencies to build and host electronic forms to document daily station routines like ambulance drug inventories, apparatus equipment, and mechanical checks. Administrators can monitor the status of staff members' licenses and certifications, upload files that members can access remotely, and send out text- and e-mail notifications to individuals or groups when the need arises to fill an open shift or staff a special event. "The biggest positive feedback I'm hearing is about the schedule status. People can look from their home and see if there is a crew or an (open slot) to fill," said Newton. "The custom form creation is a great addition. It allows us to go completely paperless for most purposes." A total of 56 Public Safety agencies across Virginia use Aladtec. Other agencies near Mineral using the software include the Louisa County Fire & EMS departments, and Spotsylvania County Fire Dept. Others include Lake Monticello Volunteer Fire Department & Rescue Squad, Inc. in Palmyra, Caroline County Fire & Rescue in Bowling Green, Chancellor Volunteer Fire & Rescue, and the Fredericksburg Fire Department in Fredericksburg. Aladtec, Inc., is headquartered in River Falls, Wis., near Minneapolis-St. Paul. The software was first developed in 2003 to solve scheduling problems at a rural ambulance service. The firm now serves more than 2,200 fire, police, EMS, dispatch- and healthcare facilities across the U.S. and Canada. For more information, visit http://www. aladtec.com, or call (888) 749-5550.